The Runner can spend click to break any subroutine on Viktor 1.0. My name is Viktor. Nice to meet you. Would you like to play a game? Stalling the runner by making them spend some (probably not much) time looking for Yog. Making them pay 5 for the 3 you did to rez him. Even non-key decoders don't exactly have a rough time of things, so it can be easy to write Viktor off as useless. 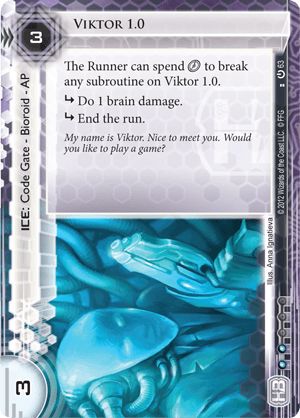 Once the card pool expands and the variety of breakers isn't so limited, I've found Viktor gains new life, becoming a pretty respectable low-cost code gate. It also highlighted something I now consider to be his best quality, even if you only play with the Core Set - he's subtle. Whereas big ICE like Heimdall 1.0 and Ichi 1.0 have the definite sense of being obstacles that really should to be broken with the right tools, Viktor is just low-strength and light on the subroutines (while still being 3 to break with something like Gordian Blade) to make the runner's fingers hesitate over that Special Order or Easy Mark and think, "Hmmm, maybe I'll just click through him instead? ", and it's been surprising (for me, anyway) how many clicks Vik can sap from the runner without being obvious about it. They might not even notice. They might think "Where did the corp get all that money? When did they get the time to put all that ICE down? Why are my card choices so limited at the moment?" and the reason might just be that a lone Viktor has being quietly pewing away at their clicks and gradually nudging you into the lead. Of course, it doesn't always happen this way. Sometimes the runner has the right thing on hand from the start. Sometimes they are drowning in cash and can just get all the breakers they need. Sometimes you're so screwed by an opening handful of agendas that you'll need something, anything, for a bit of protection, even if it's obvious. I'd say more often than not this will be the case, but in those instances where Viktor does come through, he can tip the game in your favour without even you realising it. This card may see more play now that it's natural predator, Yog.0, is no longer part of the core set. It was not a bad card even when Yog.0 was around. Two subroutines that block and bite, cheap to rez and expensive to break if you do not have a Yog.0 on hand. Okay, sure, the subroutines will often tax clicks instead. This is still a really big deal! The runner can only lose a couple of clicks before they are really lagging behind the corp. And what does one do when you are running behind? Take greater risks. Running into a Viktor 1.0 when you cannot pay its clicks is very punitive for a three cost piece of ICE. It might be time for this bad boy to come out of the binder again now that it can't be blanked by Yog.0.. The last piece of Bioroid ICE from the core set, finishing off the three primary types of ice as a code gate, and one of the few code gates that can actually do damage to the runner. This alone gives it a strength that is often overlooked. Even experienced Netrunners will look for a killer to protect themselves from damage on ICE first, not a decoder. Only two subroutines and three strength make it the weakest of the core set Bioroids, which also puts it right in Yog.0 range. This in itself is not a detriment to the card - only a fact to be aware of. Yog has certainly no longer seen the same popularity it once did, and yet still Viktor is not a very taxing piece of ice. It is also not a binary ice, given the ability to be clicked through of all Bioroids. This puts Viktor in a most difficult situation. He is not a hard stop until a decoder is found, and he does not cost the runner very much to get through. If a brain damage kill deck (which might come along with cards spoiled for the SanSan Cycle) becomes more of a definite archetype, then Viktor will undoubtedly see more play. He still see’s some play in decks that just want one or two brain damage to make a kill easier, and again the fact that he is a code gate that deals damage reinforces that. Yet his non binary status and inability to be truly taxing has left him on the lower side of desirability when designing an ICE package for corp decks.